Best wishes for the New Year from everyone involved with the choir. We have a busy year ahead so keep a look out for what’s happening on the website calendar. Many thanks too, to everyone who came along to our recent Christmas Concert. Your support is very much appreciated and we hope you enjoyed it. Gentlemen, why not come along and join the choir? You don’t have to be a fantastic singer and you certainly don’t need any musical knowledge. With a bit of perseverance you will be able to join in with what we have planned a lot quicker than you might imagine. Consider the thrill of performing with Aled Jones in June, or joining with other choirs to sing in The Sage or even The Royal Albert Hall to raise valuable funding for Cancer Research! It’s also well documented that singing is good for your health and the feeling of achievement when the audience shows their appreciation is amazing. 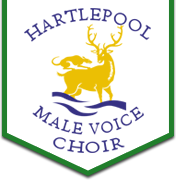 We rehearse every Friday in the Corner Flag which is behind Hartlepool Indoor Bowls Club on the north-west corner of the football ground. The practice starts at 7:30 p.m. and we can assure you of a warm welcome. You can just sit in and watch what happens or have a go straight away – the choice is yours. For more information you can contact us through this website, or give our secretary a call on 01429 423063. We look forward to hearing from you.